When Edward VIII chose to abdicate, the world's attention shifted to the new heir, the Duke of York (George VI: 1895 – 1952) and his daughter, Elizabeth (Elizabeth II: b. 1926). 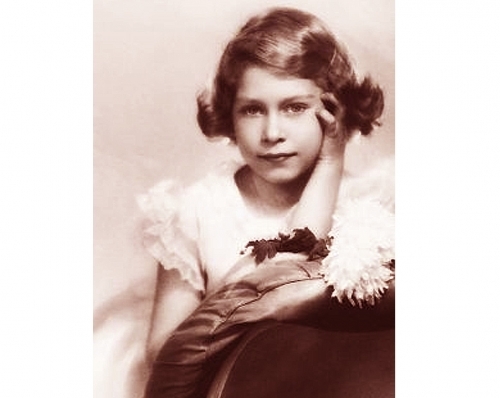 This magazine article served to introduce the future queen to American readers - making clear that the princess was something like a British version of the Hollywood child star, Shirley Temple - often imitated and recognized as the gold standard of girlhood. Written during the depression, her lavish, story-book existence seemed unreal to many. "The Elizabeth has not been told she will reign as Queen, court gossips have already speculated on her future husband. Prince Charles of Luxembourg, nine; Prince Gorm, seventeen and Prince Olaf, thirteen, of Denmark; Prince Philippe of Greece, fifteen, and Prince William Victor, seventeen-year-old grandson of of the ex-Kaiser, have all been mentioned as possible consorts of the child - if there is any royalty left by then." Read our articles about Edward VIII.